Retype Password – type the password again to confirm it. Specify your Company name, Phone number and Tax ID as additional information. After you Submit the information, a letter with an account activation link will be sent to your email address. Please follow the instructions that you receive in the email to activate your customer account. You can use Forgot Password option to restore the password to your account. Please note, if you do a fresh installation of M2E Pro Module, your customer account will be registered on Client’s Portal automatically. You will be emailed an account activation link and offered to create a password. If you need to edit your customer account details, you can do it on clients.m2epro.com After you sign in, click on the email address link in the top right corner of the page. On this page, you can edit Account Billing Details, change Login Email and Password, confirm if you want to receive automatic Notifications. Under the tab Extension Keys, you can view the list of the associated Extensions, obtain a new Extension Key or delete those ones which are not used any longer. The Extension Key is registered automatically during the initial Configuration Wizard in M2E Pro module. If the new Key is generated on the Client’s Portal, you should insert it in the Admin Panel of your Magento: in System > Configuration > M2E Pro > Billing Info (for Magento v1.x.) or eBay/Amazon Integration > Configuration > Settings > License (for Magento v2.x). 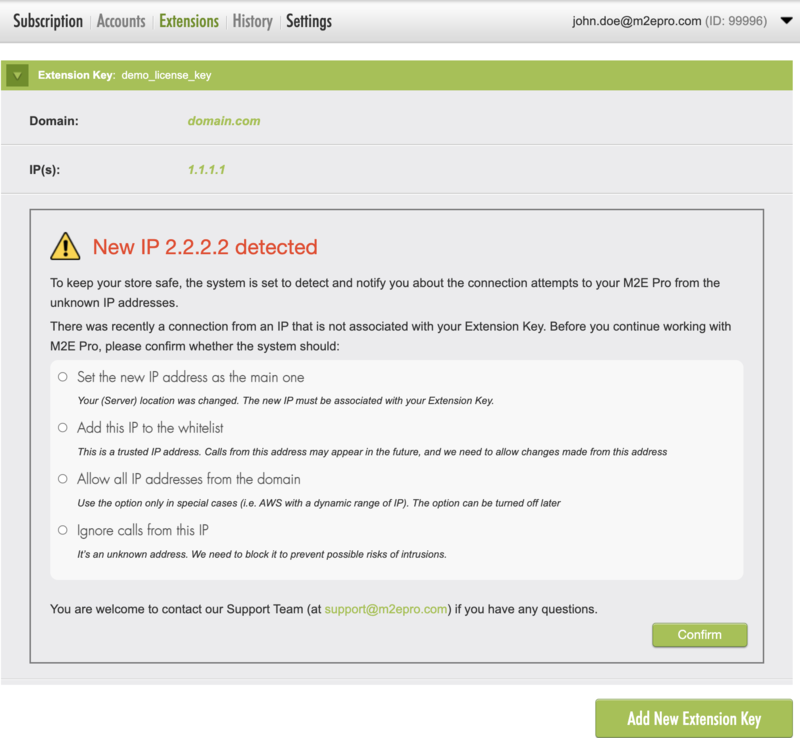 Each Extension Key undergoes validation based on Domain name and IP addresses. This is done to prevent inconsistent access to your data. It also protects from the risk of the synchronization being performed from several instances simultaneously. If you change your Magento location, you will need to obtain a new Extension Key on clients.m2epro.com and update it in your M2e Pro extension. Once M2E Pro detects an IP address which is not associated with your Extension Key, you will be notified about it in your customer account and via email. Please follow the instructions provided in the notification message. Consult M2E Pro Support Team on any issue that you face. If the Extension Key is no longer used, you can remove it. You can find the billing details under the Billing History tab. For each of the Billing Cycles, you can Download a Detailed Order Report to review the list of the orders included in the Total Sales. Any past transaction Invoice can also be be downloaded here. Select the Currency and Payment Method under the Billing Settings tab. Please select the Currency that you would like to use for your account billing. Important: You cannot change the Currency preference after the settings are saved. Under the Exchange Rates, you can find the Rates used for currency conversion. On this page, you can edit your Billing Address details. The payment system will use this Information to generate Invoices for your account. All new M2E Pro customers have a 30-day free trial period starting from the account registration date. After the trial period is over, the paid billing period starts automatically. At the end of the first Paid Period (60 days past the Extension Key registration date), customers must have an active subscription to one of the available Pricing Plans. The final fee is estimated based on the monthly Total Sales and terms of the Subscription Plan. Channel Account – a seller account which is identified by eBay User ID, Amazon Merchant ID or Walmart Consumer ID and Marketplace. Payment Method – the way in which customers pay for their Subscription. Among the available Payment Methods, there are Credit Card, PayPal for Italy and Germany (other countries on individual request), Bank Transfer (for annual Plans only), No Payment Selected (for the free Plan only). Currency – the currency in which the account bills are paid. After the settings are saved, the currency preference cannot be changed. All account payments and total sales amount are converted into the selected currency according to the Mastercard rate. Customers can choose between a monthly or an annual subscription. For Monthly Plans, the payment is collected at the end of each billing cycle. The Annual Plan cost is collected prior the starts of a new billing cycle. This is the amount of sales throughout all connected Channel Accounts during a billing cycle. If the Total Sales Allowance is exceeded, the Additional Cost is collected according to the conditions of the Pricing Plan. More details about Subscription Plan terms can be found here. We recommend Subscribing to one of the Plans before the end of the first billing period to avoid getting your account suspended. You should use Subscribe button under the Subscription tab to activate the Subscription. You will need to confirm/adjust the Billing Details you provided. Once all the data is filled in, please, press Continue button at the top of the page to move to the next step. Please note, this Step is optional. Follow the instructions below only if the Extension Key has not been automatically generated during your M2E Pro Instance registering. On this Step, the Extension Key will be automatically generated. You need to copy the Key to your M2E Pro installation in Magento (System > Configuration > M2E Pro > Billing Info section for M2E Pro for Magento v1.x and in eBay Integration/Amazon Integration > Configuration > Settings > License section for M2E Pro for Magento v2.x). eBay, Amazon and Walmart Channel Accounts configured in your M2E Pro Extension will become automatically associated with your customer account on Client’s Portal. If no Channel Accounts are available, you should check whether the correct Extension Key is used in your M2E Pro extension (System > Configuration > M2E Pro > Billing Info for Magento v1.x and in eBay/Amazon Integration > Configurations > Settings > License section for Magento v2.x). If the Extension Key is not provided, you can obtain one in your account on Client’s Portal. Click Add New Extension Key under the Extension Keys tab. Copy the newly generated Key to M2E Pro License section in your Magento. Before moving to the next step, please review the Channel Accounts that the Subscription will cover. Move – generates a request to M2E Pro Support Team to move a Channel Account to an email of a different customer. The Channel Account will be moved after a Support Agent confirms it. This step is optional. It will be skipped if you have already selected the Currency for your account. The payments and the total sales amount will be converted to the selected currency according to the Master Card rate. Please note that once the currency is selected, it cannot be changed. On this step you should select the Subscription Plan you are going to use. On this step, you should confirm the Payment Method you are going to use to pay your account bills. If you subscribe to the Free Plan, you can set the Payment Method to No Payment Selected. Customers subscribed to the Free Plan are not expected to make regular payments. Only if the amount of 30-day Total Sales exceeds the plan allowance, the Additional Cost will be estimated. You will be required to change the Payment Method and pay the Additional Cost to prevent the Subscription from being suspended. If you use Bank Transfer payment method, it may take some time before a transaction is processed. Only after the payment is received and credited to your account Balance, the Subscription may be activated. Our Congratulations! Your Subscription is activated now! If you need to change the Subscription Plan, please use Change Plan button. Please note that the system will update the Plan of your monthly Subscription to a new one only after the new billing cycle starts. If you change your Free Plan to a paid one, you will be able to revert back to the Free Plan only after a 3-month period passes. You can change your Monthly Plan to an Annual one any time. The annual cycle will start from the activation date of the Annual Subscription. To activate the Annual Subscription, the payment is required to be made first. If you are going to use Bank Transfer to pay for Annual Subscription, you should send the funds upfront. Only after the payment is received and credited to your account Balance, your Subscription will be activated. If you are already subscribed to an Annual Plan, you can upgrade it to the one with a higher sale allowance. The Plan will be upgraded immediately after the plan cost difference is paid. You can downgrade your Annual Plan only after the the next billing cycle starts. What should I do if the Billing Cycle is ended? After your Billing Cycle is finished, the system will automatically attempt to collect the payment for the next period. You will receive an electronic notification if the payment cannot be processed. To prevent Service termination, you should confirm that the requested amount can be charged through the Payment Method set in your account. If any Additional Cost is estimated while No Payment Selected is set in Billing Settings of your account, you will be required to provide a valid Payment Method to let the system collect the payment. Your Subscription will be suspended if none of the 4 predefined automatic attempts to collect the amount is successful. To restore the subscription after it is cancelled, you will need to update the Payment Method first, and then use Pay Now button under the Subscription tab. If Bank Transfer is set as a default Payment Method for your account, you should transfer the funds in advance. Only after the payment is received and credited to your account Balance, you can use Pay Now button to submit the fee. Now button to submit the fee. After you submit a Cancellation Request, an agent from M2E Pro Support Team will contact you to confirm the terms and the date of your subscription Cancellation.